Melbourne City Council, front runner and celebrity candidate, Robert Doyle failed to front up to the Press Council’s grill the candidates’ breakfast. Doyle’s absence and lack of commitment to the City election has been a notable talking point throughout the campaign. By not turning up to meetings and public events Robert Doyle has avoided public scrutiny and questioning over his leadership and policies for Melbourne. The level of contempt shown by Robert Doyle seriously undermines confidence in the the direct election of Lord mayor. 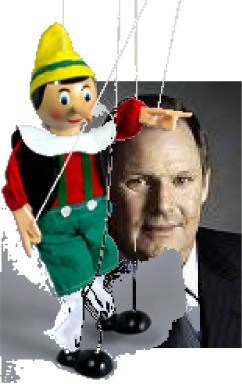 Robert Doyle has been a silent puppet candidate with his Deputy candidate, Susan Riley, pulling the strings. Susan Riley was John So’s former Deputy Lord Mayor before being dumped by John So in favour of Gary Singer. He has thumbed his nose at the people of Melbourne and expects to be elected Lord Mayor on the strength of his name alone. Robert Doyle’s lack of participation and minimial activity in the campaign does nothing to support his billboard campaign slogan “Activate Melbourne”.